My body is gone but I'm always near. My spirit is free, but I'll never depart. I'm the warm moist sand when your at the beach. the cool clear water in a quiet pond. Just look for me Mom, I'M EVERYPLACE!!! 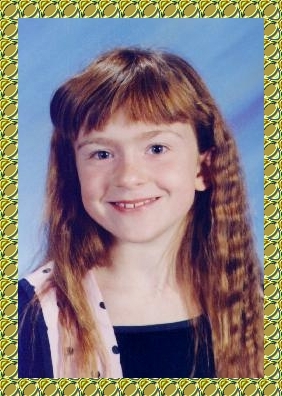 Our precious daughter was nine years and two months old when she was struck by a car while trying to get to her school bus. Michelle donated her corneas and gave the gift of sight to two young men. 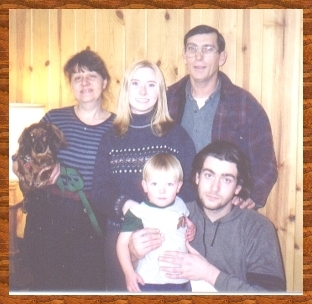 Michelle also gave the gifts of Life as she was one of only fourteen organ donors in the Inland Northwest for 1993. Michelle will always be remembered for her loving and giving ways. Her sharing in life and of giving in her death will never be forgotten. Her vibrant green eyes always shined with the light of happiness and her smile gave others wings to fly. 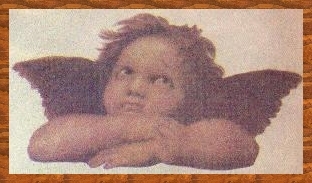 Her auburn hair was so unique her teacher once remarked "Lady Clairol would love to have that hair color"! She was very talented musically and artistically. Michelle always decorated everyone's path with her beauty and her creativity. 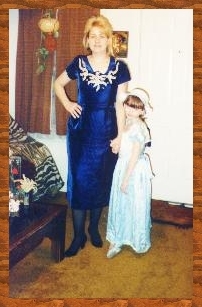 Michelle loved nature and loved life, even the littlest of bugs she would cherish and adore in the palms of her hands.. This is the last picture Michelle drew for me days before she died. 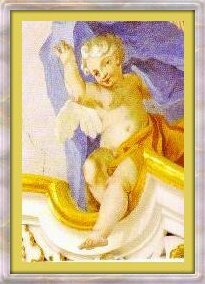 To Visit my Pages for my Michelle and other pages I have created please navigate the pick a page box below and click on the page you wish to view and then click the Go to selected page box to view. Please note that my site is always under construction, Thanks.. 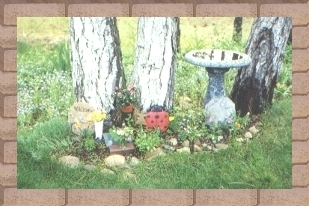 This is Michelle's Angel Garden in our yard which I created for her, it has her Plaque with her name underneath the first tree. You may visit our Michelle's other Memorials by clicking the following links, you may light a candle or sign the Guestbook to let us know you were there, ThankYou. 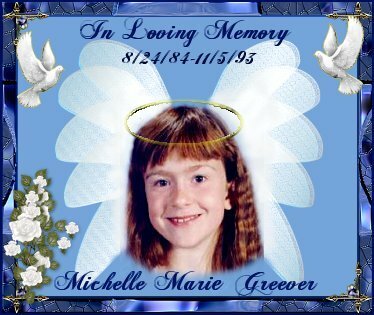 Michelle Maries Virtual Memorial Site Begun in 1997. Michelle Maries Much Loved Site Begun in 2018. 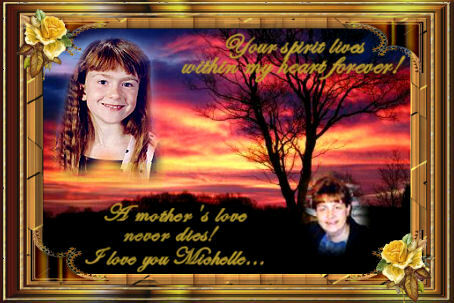 Please light a candle for Michelle at REMEMBERED BY US Site. The site below was closed by Gone Too Soon in 2018 when they Shut down their entire site. 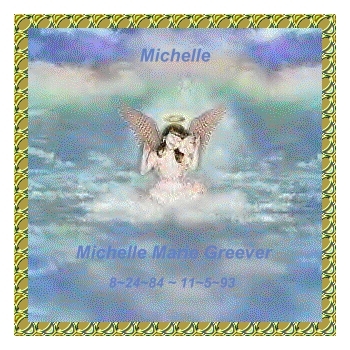 Michelle Maries Gone Too Soon Memorial Site Begun in 2009. 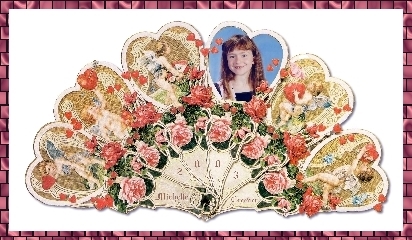 Please visit *Michelle's Special CROWNS Page* by clicking on the URL below. 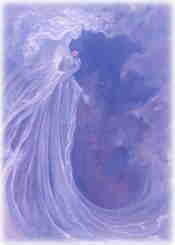 Please visit My Michelle Marie's Site by clicking on the URL below. 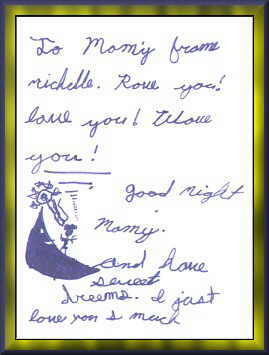 You may view our Michelle's older Guestbooks from htmlgear by clicking the links below, ThankYou. 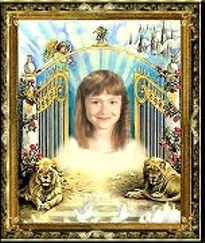 "Our Angel Michelle" with 120 entries Begun in 2002. Guestbooks 4, 5 and 6.